Please welcome my second guest blogger, Catherine from Farmwife at Midlife, GROW Casey County, and In the Pantry. Yes, folks, you read that correctly! She maintains three different blogs! In addition, Catherine is the author of _In the Pantry--Its History and Modern Uses_. You can find more information about this book and her other endeavors at her website. Today she is going to introduce us to a New England inspired Hearty Corn Chowder. Thanks, Catherine! The first time I made corn chowder, I was a sixteen-year-old exchange student in England in 1979. As a gift, I had brought my home-stay family a copy of a quintessential New England cookbook, published by Yankee Magazine around 1976 (my own copy is kicking around here somewhere), called Yankee Magazine's Favorite New England Recipes (compiled by Sarah B.B. Stamm and "the Lady Editors" of the magazine, one of whom would have been my future mother-in-law, although I did not know it at the time and, sadly, never met her). My fellow Americans and I had to put on a program for the Mayor of Lincoln and his large retinue and our collective home-stay families, and I thought, "Why not cater an American dinner?" Yes, why not? After all, my catering experience thus far had been limited to a meal prepared for my Girl Scout Cooking badge, various dishes for a Medieval dinner in high school (fried oranges, anyone?) and numerous attempts at playing "restaurant" for my poor, suffering family at home. The meal took place in a small church hall, and the only dish I remember making that evening was the corn chowder from this particular cookbook (but I know there were other items, too). Perhaps the reason it was so memorable is because, whilst serving the chowder, I accidently dumped some in the Mayor's lap. He was gracious, but I was reddened by embarrassment and beyond mortified! [It was a good thing our talent show following the meal included our wearing big sacks over our torsos to emulate large faces.] And thus ended any prospect of a catering (or waitressing) career! However, I have made corn chowder many times since for my family and always without benefit of a recipe. When I made it before Christmas so that I could also record the ingredients for this blog post, my husband said, "This is your best yet!" I hope you'll agree, even if I can't find the original Yankee cookbook, still in a box from our move, that prompted this version many batches ago. This is a hearty milk-based New England soup, or chowder––perfect on a cold winter's day with a loaf of crusty bread (or better yet, oyster crackers). You can also use this recipe, with minor changes, to make any number of chowders. * In about an hour, from start until serving, you will have a big vat of chowder to feed many appetites––and, if you are lucky, you'll even have leftovers for the next day. Chowder is even better once the flavors have had a chance to meld. 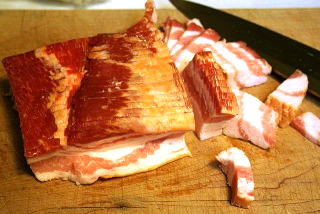 On medium high heat in a Dutch oven, large skillet or heavy-duty stock pot, cook bacon, with garlic, until almost done and starting to crisp up a bit. Stir frequently and do not drain! Add onions, celery, parsley (and red bell pepper, if desired) and cook until translucent, stirring regularly. Add salt and pepper. Stir. 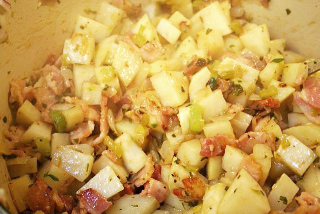 Add diced potatoes. Stir for several minutes. 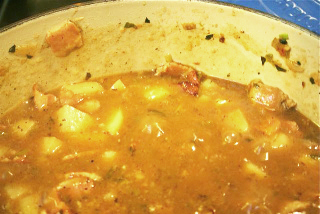 Add the flour (3/4 cup if you want a slightly thicker chowder) and stir well. Add 1 quart chicken stock and stir until thickened and bubbly. Add paprika (about one large teaspoon). Set to low, stirring occasionally, until potatoes are done, but not too soft (about 15 minutes). 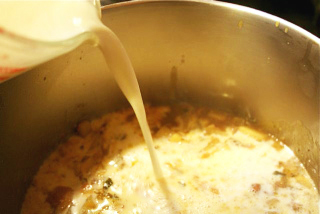 Transfer your chowder "roux" to a large 2-gallon kettle. Heat roux on low, with 6-8 cups whole milk until just before boiling (do not boil!). Stir well as mixture will start to thicken somewhat from the roux. Add 8 cups corn (frozen is fine, or canned, but drain canned corn first––and fresh corn off the cob is even better!). Cook on low, stirring frequently, until nicely heated. Shortly before serving, add heavy cream and stir in. Serve with homemade croutons, a good crusty bread or old-fashioned oyster crackers. I like to turn off the kettle when the chowder is done, cover it, and take it off the burner. This will keep it warm until supper but will assure that the soup doesn't boil. You can also freeze this. It makes almost two gallons, too, so perfect for a crowd or for a stretch of easy winter meals for your family. And remember, you can take the girl out of New England, but you can't take New England out of the girl! For SEAFOOD, substitute 1 quart fish or lobster stock for the chicken stock and 2 pounds assorted fresh (or frozen) seafood: scallops, shrimp, tilapia, clams, lobster, etc. **Another New England aside, as that is where we lived for many years (my husband and children were born and raised there and I spent childhood summers and much of my life there until age 45), is that there is socialite named Smoki Bacon who still lives in Boston's Back Bay. How can I not think of her whenever I open a package of bacon? 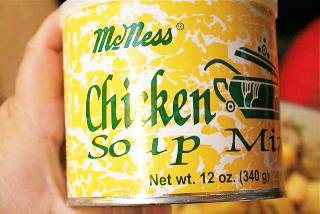 ***McNess Chicken Soup Mix is a secret ingredient in many of my recipes, including our creamed spinach, served several times a year with roast lamb or beef. I get it at the Amish stores in Crab Orchard, Kentucky. You can also order it from www.McNess.com. Photos courtesy of the guest blogger. 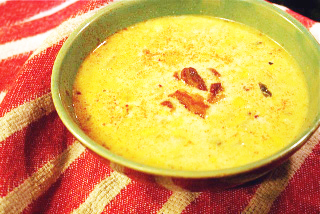 The corn chowder is mouthwatering, thank you for sharing your recipe! I will make this at home and serve to my family. Your Hearty Corn Chowder recipe is unique. I am excited to try this later. This is perfect with homemade croutons, a good crusty bread or old-fashioned oyster crackers. Soccer replica jerseys is the term used for the top apparel worn by a sports team member and it is made of flexible and comfortable material. The colors used for the jersey symbolizes the sports for which the person is playing and the name and number of the player are printed on the back and sometimes in the front side of the jersey also. College basketball jerseys are worn by the players of the basketball team of that particular college. These jerseys have the number of the player in the back as well as in the front side of the jerseys. The cheap soccer jerseys bear the logo and the name of the college also. Though it is normally believed that only the players of the team are provided with the respective jerseys, in reality the students who do the work of cheering the team of their college are also prized with soccer jerseys. However, if you are extremely passionate about the basketball team of your college, you can buy replica jerseys that are available at any online store. There are many reasons why wearing college football shirt and jerseys are significant. In addition to comfort and identification, it promotes the unity of the team as well. Wearing the same color, design and style of jerseys and shorts have psychological effect on the team members and they are easily detected as who they are and from where they have come. These are extremely helpful during tournaments and competitions.